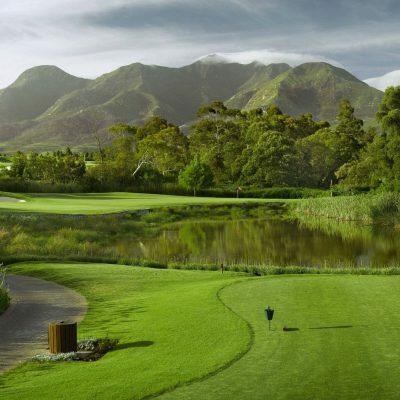 Set against the backdrop of the majestic Langeberg Mountain Range, the Garden Route Game Lodge guards the entrance to the Coast. Only 3½ hours drive from , this malaria free, private game reserve is home to an abundance of animal and bird life including the Big 5. 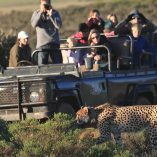 Visitors to the Garden Route Game Lodge can enjoy game viewing in open Land Rovers, luxury accommodation and a memorable dining experience in our Boma restaurant. Our friendly staff and management are there to take care of your every need to complete your unforgettable stay. Our recently refurbished spacious Lodge rooms combine luxury and comfort with an African theme. Complete with en-suite bathrooms, the Lodge rooms lead onto a West facing balcony which offers breathtaking African sunsets all within steps of the pool. These rooms are ideal for families and are located closer to the Lodge amenities. 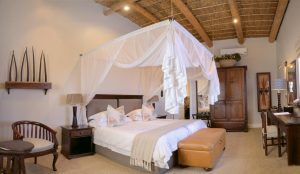 Exclusive Garden Route accommodation in luxury thatched chalets with en-suite bathrooms designed to offer guests complete comfort and relaxation in a beautiful setting.The use of natural materials such as thatch, stone and timber, blend in with the African style decor to create an unforgettable impression. 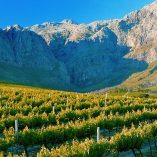 Linked to the Main Lodge via a wooden walkway overgrown with Aloes and fynbos, the chalets offer seclusion and privacy ideal for honeymoon couples. Dining at the Garden Route Game Lodge is a relaxed affair where guests get a chance to discuss the days game viewing and make new friends. Dinner in our African Boma provides guests with a unique dining experience where a hearty menu of tasty traditional cuisine and chefs specialities are presented on open coals in African pots. 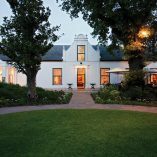 Our friendly and attentive waiters are on hand to explain the menu or advise you on our selection of fine South African wines. (Breakfast and dinner are included in your stay. Special children’s menus and meal times are available). Alternatively the breathtaking Serengeti’s Restaurant offers guests a more interactive dining experience where safari cuisine is prepared by our chef to your liking. The expansive wooden decks overlooking the valleys below allow guests to relax and unwind to the sounds of the African night. 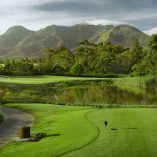 Ayana Spa at Garden Route Game Lodge is set against the backdrop of the majestic Langeberg Mountain Range and offers an exclusive range of unique experiences and treatments. Take a break from the outside world and pamper yourself. Quiet your thoughts. Relax your mind. Rejuvenate your body. Live in the moment. 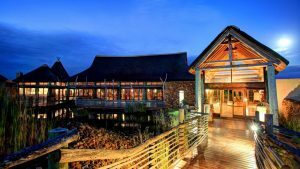 The conference center at the Garden Route Game Lodge provides an ideal setting for your next conference, bush breakaway, team building or group incentive weekend. 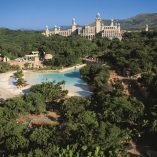 Built from stone and thatch, the center blends in with the natural surrounds to complete this unique setting. This air-conditioned facility comes fully equipped with all the necessary AV equipment and can comfortably accommodate up to 60 delegates. 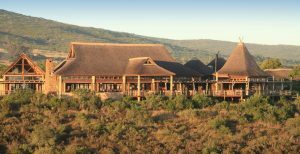 The nearby breakaway lapa overlooks a water hole and provides delegates with a chance to view some wildlife while enjoying a refreshments break. Apart from taking in the breathtaking scenery, tailor-made activities can be arranged to further enhance your bush experience. 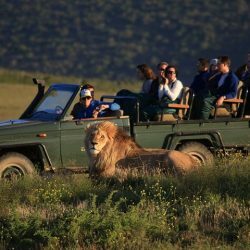 Morning and evening game drives are led by experienced game rangers who share their knowledge of big game as well as the many other antelope species, birdlife and local African folklore. 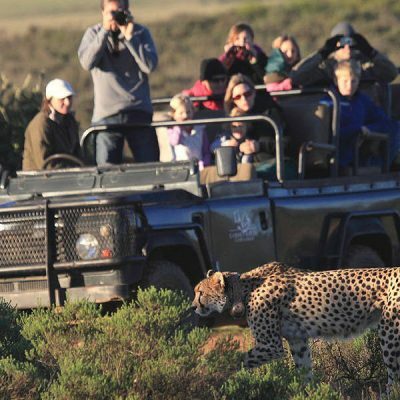 Garden Route Game Lodge is currently home to giraffe, white rhino, lion, elephant, kudu, zebra, wildebeest, and many other species of game. 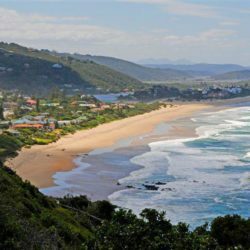 No stay at the Garden Route Game Lodge is complete without a tour of the Reptile center where our resident Herpetologist (snake man), will share his knowledge of snakes, crocodiles and other cold-blooded creatures. An absolute must for families.